The Return of Persephone by Frederic Leighton (1891). A dying-and-rising god is born, suffers a death-like experience, and is subsequently reborn. A dying-and-rising, death-rebirth, or resurrection deity is a religious motif in which a god dies and is resurrected. "Death or departure of the gods" is motif A192 in Stith Thompson's Motif-Index of Folk-Literature, while "resurrection of gods" is motif A193. Examples of gods who die and later return to life are most often cited from the religions of the Ancient Near East, and traditions influenced by them including Biblical and Greco-Roman mythology and by extension Christianity. The concept of dying-and-rising god was first proposed in comparative mythology by James Frazer's seminal The Golden Bough. Frazer associated the motif with fertility rites surrounding the yearly cycle of vegetation. Frazer cited the examples of Osiris, Tammuz, Adonis and Attis, Dionysus and Jesus Christ. Frazer's interpretation of the category has been critically discussed in 20th-century scholarship, to the conclusion that many examples from the world's mythologies included under "dying and rising" should only be considered "dying" but not "rising", and that the genuine dying-and-rising god is a characteristic feature of Ancient Near Eastern mythologies and the derived mystery cults of Late Antiquity. The motif of a dying deity appears within the mythology of diverse cultures – perhaps because attributes of deities were derived from everyday experiences, and the ensuing conflicts often included death. These examples range from Baldr in Norse mythology to the feathered serpent Quetzalcoatl in Aztec mythology to the Japanese Izanami. The methods of death vary, e.g., in the myth of Baldr (whose account was likely first written down the 12th century), he is inadvertently killed by his blind brother Höðr who is tricked into shooting a mistletoe-tipped arrow at him, and his body is then set aflame on a ship as it sails out to sea. 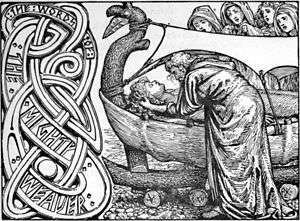 Baldr does not come back to life because not all living creatures shed tears for him, and his death then leads to the "doom of the gods". Hawaiian deities can die and depart the world in a number of ways; e.g., some gods who were killed on Lanai by Lanikuala departed for the skies. In contrast, Kaili leaves the world by a canoe which is never seen again. The Japanese god Izanami, on the other hand, dies of a fever and Izanagi goes to Yomi, the land of gloom, to retrieve her, but she has already changed to a deteriorated state and Izanagi will not bring her back, and she pursues Izanagi, but he manages to escape. Some gods who die are also seen as either returning or bring about life in some other form, often associated with the vegetation cycle, or a staple food, in effect taking the form of a vegetation deity. Examples include Ishtar and Persephone, who die every year. The yearly death of Ishtar when she goes underground represents the lack of growth, while her return the rebirth of the farming cycle. Most scholars hold that although the gods suggested in this motif die, they do not generally return in terms of rising as the same deity, although scholars such as Mettinger contend that in some cases they do. The term "dying god" is associated with the works of James Frazer, Jane Ellen Harrison, and their fellow Cambridge Ritualists. At the end of the 19th century, in their The Golden Bough and Prolegomena to the Study of Greek Religion, Frazer and Harrison argued that all myths are echoes of rituals, and that all rituals have as their primordial purpose the manipulation of natural phenomena. Early in the 20th century, Gerald Massey argued that there are similarities between the Egyptian dying-and-rising god myths and Jesus. However, Massey's historical errors often render his works nonsensical, e.g., Massey stated that the biblical references to Herod the Great were based on the myth of "Herrut" the evil hydra serpent, while the existence of Herod the Great can be well established without reliance on Christian sources. Massey's scholarship has been widely disputed, including but not only by Christian Evangelical writers such as Stanley E. Porter. The Swiss psychoanalyst Carl Jung argued that archetypal processes such as death and resurrection were part of the "trans-personal symbolism" of the collective unconscious, and could be utilized in the task of psychological integration. He also proposed that the myths of the pagan gods who symbolically died and resurrected foreshadowed Christ's literal/physical death and resurrection. The overall view of Jung regarding religious themes and stories is that they are expressions of events occurring in the unconscious of the individuals - regardless of their historicity. From the symbolic perspective, Jung sees dying and rising gods as an archetypal process resonating with the collective unconscious through which the rising god becomes the greater personality in the Jungian self. 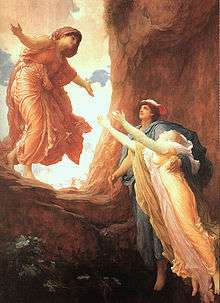 In Jung's view, a biblical story such as the resurrection of Jesus (which he saw as a case of dying and rising) may be true or not, but that has no relevance to the psychological analysis of the process, and its impact. The analysis of Osiris permeates the later religious psychology of Carl Jung more than any other element. In 1950 Jung wrote that those who partake in the Osiris myth festival and follow the ritual of his death and the scattering of his body to restart the vegetation cycle as a rebirth "experience the permanence and continuity of life which outlasts all changes of form". 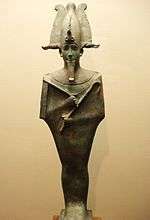 Jung wrote that Osiris provided the key example of the rebirth process in that initially only the Pharaohs "had an Osiris" but later other Egyptians nobles acquired it and eventually it led in the concept of soul for all individuals in Christianity. Jung believed that Christianity itself derived its significance from the archetypal relationship between Osiris and Horus versus God the Father and Jesus, his son. However, Jung also postulated that the rebirth applied to Osiris (the father), and not Horus, the son. 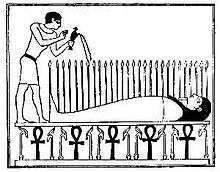 The general applicability of the death and resurrection of Osiris to the dying-and-rising-god analogy has been criticized, on the grounds that it derived from the harvesting rituals that related the rising and receding waters of the Nile river and the farming cycle. The cutting down of barley and wheat was related to the death of Osiris, while the sprouting of shoots was thought to be based on the power of Osiris to resurrect the farmland. In general rebirth analogies based on the vegetation cycle are viewed as the weakest elements in the death-rebirth analogies. In Greek mythology Dionysus, the son of Zeus was a horned child who was torn to pieces by Titans who lured him with toys, then boiled and ate him. Zeus then destroyed the Titans by thunderbolt as a result of their action against Dionysus and from the ashes humans were formed. However, Dionysus' grandmother Rhea managed to put some of his pieces back together (principally from his heart that was spared) and brought him back to life. Scholars such as Barry Powell have suggested Dionysus as an example of resurrection. The category "dying-and-rising-god" was debated throughout the 20th century, most modern scholars questioning its ubiquity in the world's mythologies. By the end of the 20th century the overall scholarly consensus had emerged against the category, given its limited applicability outside of Ancient Near Eastern religions and derived traditions. Tryggve Mettinger (who supports the category) states that there is a scholarly consensus that the category is inappropriate from a historical perspective. Kurt Rudolph in 1986 argued that the oft-made connection between the mystery religions and the idea of dying and rising divinities is defective. Against this view, Mettinger (2001) affirms that many of the gods of the mystery religions do indeed die, descend to the underworld, are lamented and retrieved by a woman and restored to life. While the concept of a "dying-and-rising god" has a longer history, it was significantly advocated by Frazer's Golden Bough (1906–1914). At first received very favourably, the idea was attacked by Roland de Vaux in 1933, and was the subject of controversial debate over the following decades. One of the leading scholars in the deconstruction of Frazer's "dying-and-rising god" category was Jonathan Z. Smith, whose 1969 dissertation discusses Frazer's Golden Bough, and who in Mircea Eliade's 1987 Encyclopedia of religion wrote the "Dying and rising gods" entry, where he dismisses the category as "largely a misnomer based on imaginative reconstructions and exceeding late or highly ambiguous texts", suggesting a more detailed categorisation into "dying gods" and "disappearing gods", arguing that before Christianity, the two categories were distinct and gods who "died" did not return, and those who returned never truly "died". Smith gave a more detailed account of his views specifically on the question of parallels to Christianity in Drudgery Divine (1990). Smith's 1987 article was widely received, and during the 1990s, scholarly consensus seemed to shift towards his rejection of the concept as oversimplified, although it continued to be invoked by scholars writing about Ancient Near Eastern mythology. As of 2009, the Encyclopedia of Psychology and Religion summarizes the current scholarly consensus as ambiguous, with some scholars rejecting Frazer's "broad universalist category" preferring to emphasize the differences between the various traditions, while others continue to view the category as applicable. Gerald O'Collins states that surface-level application of analogous symbolism is a case of parallelomania which exaggerate the importance of trifling resemblances, long abandoned by mainstream scholars. A main criticism charges the group of analogies with reductionism, insofar as it subsumes a range of disparate myths under a single category and ignores important distinctions. Marcel Detienne argues that it risks making Christianity the standard by which all religion is judged, since death and resurrection are more central to Christianity than many other faiths. Dag Øistein Endsjø, a scholar of religion, points out how a number of those often defined as dying-and-rising-deities, like Jesus and a number of figures in ancient Greek religion, actually died as ordinary mortals, only to become gods of various stature after they were resurrected from the dead. Not dying as gods, they thus defy the definition of “dying-and-rising-gods”. Since the 1990s, Smith's scholarly rejection of the category has been widely embraced by Christian apologists wishing to defend the historicity of Jesus, while scholarly defenses of the concept (or its applicability to mystery religion) have been embraced by the "new atheism" movement wishing to argue the "Christ myth theory". ↑ Thompson's categories A192. Death or departure of the gods and A193. Resurrection of gods. S. Thompson, Motif-index of folk-literature : a classification of narrative elements in folktales, ballads, myths, fables, medieval romances, exempla, fabliaux, jest-books, and local legends, Revised and enlarged. edition. Bloomington : Indiana University Press, 1955-1958, p. 106. 1 2 Garry and El-Shamy (2004:19f. ), citing Mettinger (2001:217f. ): "The world of ancient Near Eastern religions actually knew a number of deities that may be properly described as dying and rising [... although o]ne should not hypostasize these gods into a specific type ' the dying and rising god.'" 1 2 3 4 5 6 7 8 9 10 11 12 13 Garry, Jane; M El-Shamy, Hasan (December 1, 2004). Archetypes and Motifs in Folklore and Literature; a handbook. pp. 19–20. ISBN 0765612607. ↑ Ackerman 2002, 163, lists divine kingship, taboo, and the dying god as "key concepts" of not only Frazer, but Harrison and others of the ritualist school, in contrast to differences among these scholars. ↑ Massey, Gerald (1907). Ancient Egypt, the light of the world. London: T. Fisher Unwin. pp. 728–914. ISBN 978-1-4588-1251-3. 1 2 Crowley, Vivianne (2000). Jung: A Journey of Transformation:Exploring His Life and Experiencing His Ideas. Wheaton Illinois: Quest Books. ISBN 978-0-8356-0782-7. ↑ Zittell Smith, Jonathan (1969). The Glory, Jest and Riddle. James George Frazer and The Golden Bough (PDF). Yale dissertation. ↑ Gale, Thomson. "Dying and Rising Gods". Home Search Research categories. Encyclopedia.com. Retrieved 10 October 2016. ↑ Jonathan Z. Smith "On Comparing Stories", Drudgery Divine: On the Comparison of Early Christianities and the Religions of Late Antiquity (1990), 85–115. ↑ Albert McIlhenny, This Is the Sun? : Zeitgeist and Religion, Labarum Publishing (2011), chapter 14, "Dying and Rising Gods", 189–213. Itself published with a Christian apologist publisher, and mostly focussing on the naive "Christ solar myth" meme propagated by the 2007 film Zeitgeist, McIlhenny (2011) criticizes the agenda-driven selective reception of scholarship on both sides, in Christian apologetics (embracing Smith) and popular atheism (embracing Mettinger). Ackerman, Robert (2002). The Myth and Ritual School: J.G. Frazer and the Cambridge Ritualists. New York: Routledge. 1979. Structure and History in Greek Mythology and Ritual. London: University of California Press. Cumont, Franz (1911). The Oriental Religions in Roman Paganism. Chicago: Open Court. Cumont, Franz (1903). The Mysteries of Mithra. London: Kegan Paul. Miles, Geoffrey. 2009. Classical Mythology in English Literature: A Critical Anthology. Taylor & Francis e-Library. Smith, Jonathan Z. (1987). "Dying and Rising Gods." In The Encyclopedia of Religion: Vol. 3.. Ed. Mircea Eliade. New York: Simon & Schuster Macmillan.